scarpino committed R1006:62bcc52389e5: There's no need to push _site folder (authored by scarpino). scarpino committed R1006:a06dc8f8ce0f: Initial import from WordPress (authored by scarpino). scarpino updated the summary of D11436: Add Copy and Select-All Shortcuts to Choqok. scarpino requested changes to D11436: Add Copy and Select-All Shortcuts to Choqok. scarpino updated the diff for D9854: WIP: Support for Remote Desktop Gateway. 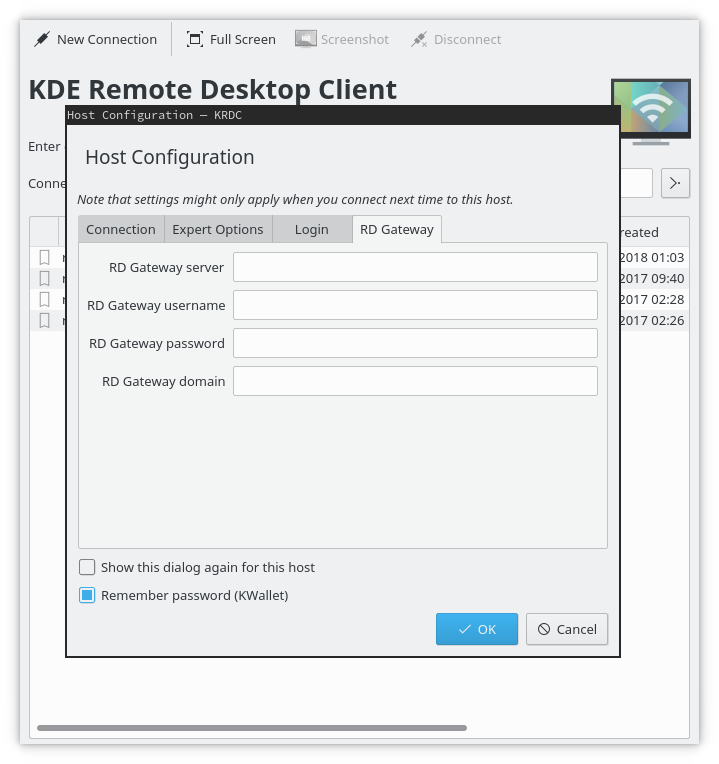 scarpino added a comment to D9854: WIP: Support for Remote Desktop Gateway. BTW, I really don't know how to handle the RDpassword. I would like to store that into KWallet, but that is an 'host preference' for KRDC and the kwallet isn't accessible from that class. Should I implement it that way? scarpino added inline comments to D9854: WIP: Support for Remote Desktop Gateway. scarpino retitled D9854: WIP: Support for Remote Desktop Gateway from Support for Remote Desktop Gateway to WIP: Support for Remote Desktop Gateway. 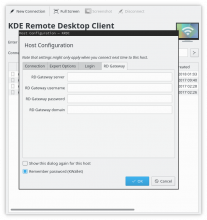 scarpino updated the summary of D9854: WIP: Support for Remote Desktop Gateway. scarpino committed R436:e835305f44d1: Add .arcconfig file (authored by scarpino). scarpino updated the diff for D9746: openconnect: support MFA. scarpino committed R186:3eb6cec252d5: Cosmetic (authored by scarpino). scarpino committed R186:cb3528728250: [twitterapi] fix followers set (authored by scarpino). scarpino committed R186:9e97233f88f4: Revert "[gnusocial] skip tags and geopoints" (authored by scarpino). Revert "[gnusocial] skip tags and geopoints"
scarpino added a reverting change for R186:8cfc1dd09178: [gnusocial] skip tags and geopoints: R186:9e97233f88f4: Revert "[gnusocial] skip tags and geopoints". scarpino committed R186:0ab2c5b2b686: Add Mastodon support (authored by scarpino). scarpino committed R186:8cfc1dd09178: [gnusocial] skip tags and geopoints (authored by scarpino). scarpino committed R186:73f0a03fc706: Add Mastodon support (authored by scarpino). scarpino committed R186:1bcd685b695f: [pumpio] fix post escaping after QtNetworkAuth port (authored by scarpino). scarpino committed R186:36dc6da8c9ef: Add Mastodon support (authored by scarpino). scarpino committed R186:807e4d0a7446: [twitterapi] fix post creation after QtNetworkAuth port (authored by scarpino). scarpino committed R186:779591e46b65: Add Mastodon support (authored by scarpino). scarpino committed R186:660d86cffc97: Migrating to new Qt5 connect(signal,slot) method (authored by scarpino). scarpino committed R186:8f98d434ebea: Add Mastodon support (authored by scarpino). scarpino committed R186:65aa0f6ddac5: [gnusocial] store profiles page url (authored by scarpino). scarpino committed R186:510f79daf615: Add Mastodon support (authored by scarpino). scarpino committed R186:f1f3f703950a: Add Mastodon support (authored by scarpino). scarpino committed R186:f8285c357268: QtNetworkAuth is smarter and this is no more needed (authored by scarpino). scarpino committed R186:1a82ab946f01: Add Mastodon support (authored by scarpino). scarpino committed R186:dcdfcb208e4f: Update README (authored by scarpino). scarpino committed R186:78350b0877ae: Add Mastodon support (authored by scarpino). scarpino committed R186:14c71e06d790: Drop format attribute (authored by scarpino). scarpino committed R186:f98acf069e66: Add Mastodon support (authored by scarpino). scarpino committed R186:b75eee9694bb: Store more informations about quoted, repeat and reply users (authored by scarpino). scarpino committed R186:78528b62a0f0: Add Mastodon support (authored by scarpino). scarpino committed R186:34c6777d8f04: Cleanup: remove followersCount base attribute (authored by scarpino). scarpino committed R186:940adaba4ac8: Add Mastodon support (authored by scarpino). scarpino committed R186:08585902c017: Use QUrl() instead of QString() where needed (authored by scarpino). scarpino committed R186:d1b0426109e5: Add Mastodon support (authored by scarpino). scarpino committed R186:efaa61b10b5a: Count unread posts between all accounts (authored by scarpino). scarpino committed R186:a014cea70762: Cleanup: yfrog is defunct (authored by scarpino). scarpino committed R186:26eb66cec11a: [gnusocial] skip linkback statuses (authored by scarpino). scarpino committed R186:c65fc1d6b42b: Add Mastodon support (authored by scarpino). scarpino committed R186:272b2c8e2f24: Add Mastodon support (authored by scarpino). scarpino committed R186:42fd84252108: Change in MicroBlog::profileUrl signature (authored by scarpino). scarpino added a reverting change for R186:3cdd81b3d67e: Change in MicroBlog::profileUrl signature: R186:42fd84252108: Change in MicroBlog::profileUrl signature. scarpino committed R186:3e0c15cdaafb: Add Mastodon support (authored by scarpino). scarpino committed R186:4fb3b58b01d4: Add Mastodon support (authored by scarpino). scarpino committed R186:4e7dfa3a06ed: Escape the description and fallback to real name (authored by scarpino). scarpino committed R186:5d13365414d7: Add Mastodon support (authored by scarpino). scarpino committed R186:ffff0c3ea4fa: Refactor generateSign() (authored by scarpino). scarpino committed R186:cc9594a3d38e: Add Mastodon support (authored by scarpino). scarpino committed R186:e54cbe7be07f: New Mastodon logo (authored by scarpino). scarpino committed R186:ce6f3388a609: Add Mastodon support (authored by scarpino). scarpino committed R186:c4f22aad945c: Use QOAuth1Signature instead of QOAuth1::signature (authored by scarpino). scarpino added a reverting change for R186:1a4b87f8d200: Fix build with Qt 5.10: R186:4830b07f6912: Revert "Fix build with Qt 5.10". scarpino committed R186:4830b07f6912: Revert "Fix build with Qt 5.10" (authored by scarpino). Revert "Fix build with Qt 5.10"
scarpino committed R186:7e0e0c4853d7: Bump Qt required version to 5.9 (authored by scarpino). scarpino committed R186:2a6b24a12d5a: QOAuth1Signature was available in 5.9 too (authored by scarpino). scarpino committed R186:21b736c67cdd: [Pump.IO] remove duplicated slash in api path (authored by scarpino). scarpino committed R186:e1520dd2a975: New Mastodon logo (authored by scarpino). scarpino committed R186:8242ad0ba2e5: Add Mastodon support (authored by scarpino). scarpino committed R186:1a4b87f8d200: Fix build with Qt 5.10 (authored by scarpino). scarpino committed R186:6ec445a74e25: [twitterapi] set twitter max length only for twitter (authored by scarpino). scarpino committed R186:f86ccd5859ee: [twitterapi] set twitter max length only for twitter (authored by scarpino). scarpino committed R186:3f05c0a996ff: New Mastodon logo (authored by scarpino). scarpino committed R186:df5f4b2727fd: Add Mastodon support (authored by scarpino). scarpino committed R186:0ecc05c1d261: [twitter] support for extended tweet (authored by scarpino). scarpino committed R186:655fe4a619de: Adjust twitter post limit (authored by scarpino). scarpino accepted D7576: Explicitly call KAboutData::setDesktopFileName. scarpino committed R32:568618eee98c: The vcs_diff icon was part of Cervisia 4.6. Since KDE 4.7 it is named vcs-diff… (authored by scarpino). scarpino committed R32:0e78595a9ca3: Squeeze/Elide session's description (authored by scarpino). scarpino committed R32:88345e484ff1: Fix build when PROJECTS_SOURCE_DIR contains spaces (authored by scarpino). scarpino committed R32:01530060bc04: Consistent styles in tooltips (authored by scarpino). scarpino committed R186:425d8b251470: New Mastodon logo (authored by scarpino). scarpino committed R186:19c529bdaa74: Add Mastodon support (authored by scarpino). scarpino committed R186:74816c3bb49f: Fix twitter lists fetching (authored by scarpino). scarpino committed R186:4c7aec3cebd5: Fix twitter lists fetching (authored by scarpino). scarpino committed R186:e9d5772e9782: New Mastodon logo (authored by scarpino). scarpino committed R186:f76295768f9b: Add Mastodon support (authored by scarpino). scarpino added a comment to D6883: QtNetworkAuth requires Qt-5.8.0 minimum. scarpino committed R186:2842d257ff54: QtNetworkAuth requires Qt-5.8.0 minimum (authored by asturmlechner). scarpino closed D6883: QtNetworkAuth requires Qt-5.8.0 minimum by committing R186:2842d257ff54: QtNetworkAuth requires Qt-5.8.0 minimum (authored by asturmlechner). scarpino accepted D6883: QtNetworkAuth requires Qt-5.8.0 minimum. Yes, I know, I was unsure about this requiment because you cannot find NetworkAuth on Qt < 5.8 systems. But I'm OK with this change, so ship it! scarpino committed R186:c43125e48387: Port to QtNetworkAuth and drop qoauth (authored by scarpino). scarpino committed R116:c86bb0d58380: Summary: L2TP: pre-sharedkey should be mask (authored by scarpino). scarpino closed D6520: Summary: L2TP: pre-sharedkey should be mask by committing R116:c86bb0d58380: Summary: L2TP: pre-sharedkey should be mask. scarpino created D6520: Summary: L2TP: pre-sharedkey should be mask. scarpino accepted D5823: Use absolute imports in GDB scripts. Looks good, I confirm this works too. scarpino abandoned D5660: Fix core module import. scarpino committed R186:9e04714bcac9: Add Mastodon support (authored by scarpino). scarpino committed R186:fab9f7629575: Port to QtNetworkAuth and drop qoauth (authored by scarpino). scarpino added a reviewer for D5660: Fix core module import: alexmerry. scarpino created D5660: Fix core module import. scarpino committed R186:229acf6cae19: Revert "Drop duplicate Donate button" (authored by scarpino). Revert "Drop duplicate Donate button"
scarpino added a reverting change for R186:eeee8d71822d: Drop duplicate Donate button: R186:229acf6cae19: Revert "Drop duplicate Donate button".